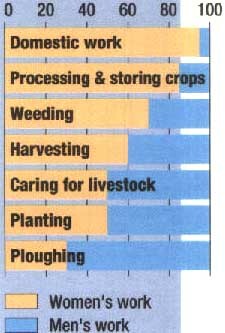 Dimensions of need - Who are the food producers? Who are the food producers? For every one farmer in the developed world there are 19 in the developing world. Where there is mechanization, fewer workers can produce more food. Over 1 000 million farmers work the land: men and women, young and old. Nearly all of them live in the developing world. Only a relatively small number, around 50 million, live in the developed countries where agriculture is typically highly mechanized. 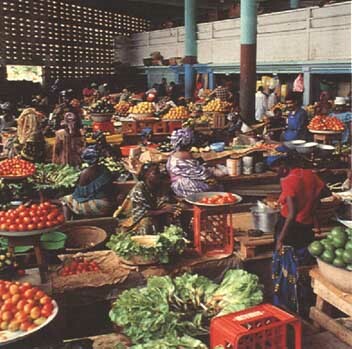 Fruit and vegetable market, Guinea. Farms have been getting bigger and bigger in the developed countries as tens of thousands of small farmers, unable to make a living, have left the land. Most of North America's food is now produced by large-scale, commercial operations. Often they integrate production with food processing, marketing and distribution in a complete agribusiness system. By contrast, farms in most of the developing world consist of small, family-owned plots, many of which have been cultivated for generations. Small farmers constitute over half the world's rural poor, but they produce about four-fifths of food supplies in developing countries. The roles of men and women in food production, processing and marketing vary, but women usually play a pivotal role. In sub-Saharan Africa, they produce and market up to 90 percent of all food grown locally. Lack of employment opportunities in rural areas gives rise to seasonal or permanent emigration, usually of men. In some parts of Africa for example, 60 percent of households are now headed by women. 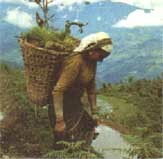 On average women work longer hours than men, but very few of them have title to the land they work. Children become farm labourers at an early age, working as many as 45 hours a week in the harvest season. Women in the developing world are almost entirely responsible for growing food for the household. And in many countries, they are also responsible for taking care of larger livestock even though the owners are usually men. In Nepal, for example, where grazing land is scarce, women are responsible for collecting fodder for the buffaloes - and a single animal can consume up to 40 tonnes of grass and leaves a year. Four broad agro-ecological zones account for 90 percent of agricultural production in developing countries. Each has a range of farming systems and a mixture of traditional and modern production systems. An enormous range of people, from the "grain barons" of the United Kingdom's East Anglia and the United States' Midwest to the small-scale farmers of Sichuan, China, from African mothers to Indian landless labourers, till the soil for a living. Large-scale farmers tend to specialize in one or two crops and nearly all of their produce is sold. They depend on external, often costly, inputs such as chemical fertilizer, high-yielding seeds and mechanization. The subsistence farmer, by contrast, produces as much of his family's food needs as possible and cannot usually afford expensive inputs. Selling produce is a secondary consideration but a hoped-for bonus to make cash purchases of household essentials. Some small-scale farmers have, however, turned to producing single cash crops for income. The merits of high input, single enterprise farming are increasingly being questioned. The need is to use inputs efficiently to keep the costs of production low while avoiding pollution and land degradation. In some instances, for example where the productive potential of the land is low or the risk of crop failure high, low input mixed farming is being encouraged. This type of farming cannot, however, produce all the tonnages needed to feed either present or future generations. 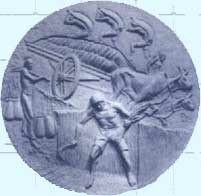 Intensified mixed farming is also required. Farming requires an array of skills: farmers must understand soil types and their limitations, know when to plant and harvest and what types of crops to rotate, when to apply organic or man-made fertilizers and pesticides, and be able to harvest and market their produce. Poorer countries in the developing regions often lack the resources to provide much help. Where resources are available, farmers still may not receive the support that matches their needs and capabilities. Small farmers in the developing world usually have only enough land to meet the needs of their families, or immediate community. Those able to produce surpluses for sale are at a disadvantage compared with large-scale farmers. Few small farmers have any control over the marketing and distribution of their produce, or even its price at the "farm gate". They also tend to be left out of mainstream development. Large-scale farmers are usually able to take advantage of new harvesting techniques and other innovations. Successful farmers may buy out smallholders, who are then forced into the ranks of the landless. By 1994, there were some 500 million landless people in rural areas of developing countries over 900 million if farmers with very little land are added in. In order to increase food production there is a need to ensure adequate food supplies and incomes for all and to draw farmers beyond subsistence level agriculture. Nearly 500 million people live in or close to forests. 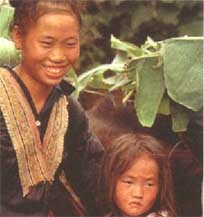 Most forest peoples grow some crops but they still rely on the natural productivity of the forests. They use many forest products: plant stems, tubers and fruits provide additional food during hungry seasons or when crops fail; wild animals are hunted for their meat and hides; and the forests provide fodder for livestock, fuelwood and medicines. Coastal mangrove forests nurture fish and crustaceans (shrimp and crabs), and provide wood for building and leaves for fodder. Tribal people such as the Bhil, Mina and Sehariya in India depend on hill forests for wood and food, while the Maku of Colombia and Brazil, hunter-gatherers living in the upper reaches of the Amazon Basin, collect everything they need from the forest. Pastoralists live and work in the world's drylands - ranging from the Texas rancher who runs cattle on 2 000 square kilometres of pasture to the nomadic Masai of Kenya and Tanzania who herd their cattle over their traditional rangelands. They raise livestock for their own consumption, or for sale to consumers in cities and towns, and as a source of savings. The largest meat producers, mainly in North and South America and Australia, cater for the international market, supplying North America and Asia. 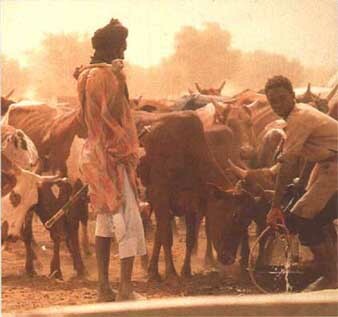 Pastoralists are often better off than settled farmers during normal times. They can move their animals to follow the rains or take them to established seasonal grazing areas. They are often the first victims, however, of prolonged environmental stress - such as extended drought. Domestic animals are less able to survive until the rains return whereas crops can be stored and some, especially new varieties, are heat tolerant and drought resistant. Developing world pastoralists have evolved ways of making productive use of some of the world's most inhospitable areas, often moving as nomads from place to place to minimize pressure on the land. Disaster can follow when their traditional ways are disrupted. When, for example, one African government decided to settle a nomadic population around some 200 permanent water holes, they had soon chopped down every tree in the area for use as fuelwood and building material. Their animals ate every blade of grass and every shrub, leaving a ring of desolation for kilometres around the water holes. Stripped of vegetation, the soil was soon blown away by the wind. 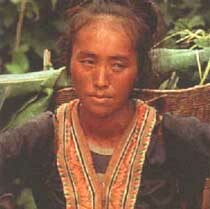 It was found that if the nomads were allowed to return to their traditional life, the land would support twice as many people and their animals. Some 20 million fishermen ply the world's seas and inland waters or farm fish. They harvest about 100 million tonnes of fish, shellfish, invertebrates and aquatic plants every year: around 80 percent of the catch is landed by commercial operators and roughly 20 percent, largely in the developing world, by the world's 12-15 million small-scale artisanal fishermen. A further 16 million tonnes are produced by fish farmers. Over half the world's fish catch is taken by developing countries. Fish is the world's largest wild food harvest, and provides the major source of animal protein for over 1 000 million people, most of them in Asia. It is also particularly important in the diet of such developed countries as Japan, Spain and Iceland. In recent years, fish stocks have been seriously depleted by large-scale commercial operations on the high seas and small and medium-scale ones in waters falling under national jurisdiction. All 17 of the world's major fishing areas have either reached or exceeded their natural limits and 9 are in serious decline. Small-scale artisanal fishermen in the tropics, who operate from canoes and small boats, are less likely to over-fish, but all too often the sheer pressure of numbers overwhelms the age-old systems for managing stocks. These traditional fishing communities are among the poorest and most neglected in the world. They often lack clean drinking water, sanitation, housing, medical care, transport and communications as well as safe and equipped harbours and connections to markets. Outside the mainstream of economic and political life, they frequently suffer as a result of a lack of recognized rights to resources and competition from medium-scale commercial operators with better access to capital, subsidies and administrations. The plight of these fishing communities has been increasingly recognized. 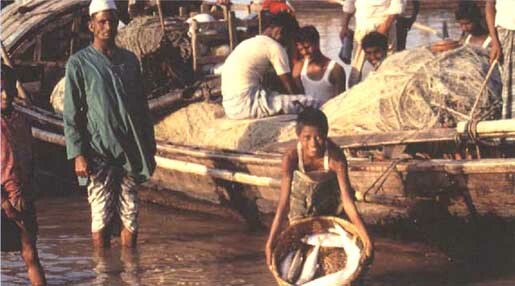 For example, FAO's Bay of Bengal Programme, which was started in 1979, focuses on promoting development in small-scale fishing communities in the Bay's seven bordering countries. This, and other development programmes, operate under the assumption that if local communities receive rights and responsibilities over resources they will be better managed.